- How modern money laundering rings are using virtual currencies, such as Bitcoin. - How analysts can proactively communicate and exchange information with counterparties through Fintel's network. Matthew Rosen, former founding Deputy Director of Mayor Bloomberg’s Financial Crime Task Force and Manhattan Assistant District Attorney, and now Chief Executive Officer and Founder of Fintel. Eric Tran-Le, Head of Product Management at Guardian Analytics. He has over 20 years of experience in Product Management and led Cloud Security Analytics at Oracle. Banking regulators encourage financial institutions to explore modern technologies to reduce significantly false alerts, investigation time and operating costs. Star One Credit Union VP Lynn Brubaker, BSA Officer, will walk through the key considerations to modernize their current AML system with Guardian Analytics Modern AML EvidenceLake™ Platform. Fraud follows speed. Faster payments leave no time for manual review of transactions and no room for high false positives. Learn how machine learning based fraud detection can mitigate fraud in real-time with low false positives, ensure positive customer experiences, and transform fraud operations from loss-recovery to loss-prevention. •	Should you detect suspicious Online and Mobile events? •	Should you detect the subsequent suspicious money transfer activities resulting from suspicious Online and Mobile events? •	Should you block an IP address coming from an infected device? and calculate a real time risk score for every digital banking user enabling Financial Institutions to detect digital banking suspicious activities. Guardian Analytics Fraud Analytics provides a single place where Fraud Managers and Business Intelligence users can collaborate on Alert, Case Risk Analytics combined with User Activity and Location Analytics cross Payment Channels. With the new FinCEN CDD rule in effect as of May 11th, 2018, financial institutions must now to identify and verify the identity of the beneficial owners of legal entity customers who own, control, and profit from companies, when those companies open accounts. This webinar will describe the impact of new rule and explain the different ways to comply with FinCEN's ruling, including how to define, collect, and monitor beneficial ownership accounts. Payroll hacks are common and they are difficult for banks to detect and prevent. From Business Email Compromise (BEC) to Payee Edit Fraud, fraudsters do not create new batch or transaction but rather modify the recipient number of an existing ACH batch. According to ACFE survey it takes almost 2 years to detect a payroll fraud. With Guardian Analytics machine learning and behavioral analytics fraud detection you can detect ACH fraud on payroll systems as they come and trigger real-time intervention to hold or reject suspicious ACH payroll transactions. This webinar is part one of the Wire Webinar Series. We will be discussing how you can leverage Guardian Analytics behavior-based, real-time wire fraud detection solution to monitor all activities and transactions for each account holder allowing you to build a profile of each user’s typical behavior. Tracked activities include hundreds of elements from payment amounts, wire originators and recipients, plus online login, session duration, sequence of activities during each session. In this webinar, Guardian Analytics AML experts will demonstrate how automation will optimize the evidence collection in a single source of truth and how a point and click modern UI will ease the investigation process and streamline the case narratives by documenting the relevant evidence for automatic e-filing. In this webinar, Guardian Analytics Fraud experts will describe the most common method and point of compromise and explain how Guardian Analytics' machine learning and behavioral analytics patented technology can help you combat Digital Banking Fraud. In this webinar, Guardian Analytics Fraud experts will describe Same Day ACH BEC fraud scheme and explain how Guardian Analytics' machine learning and behavioral analytics patented technology can help you combat ACH social engineered fraud scheme. With banks worldwide running proofs of concept for a number of use cases based on blockchain technology. It has become a question of when, not if, many of these initiatives will move into the production stage. Now is a good time to consider what the expected adoption of blockchain and cryptocurrencies are likely to mean for fraud in banking and commerce. Join Star One Credit Union, a financial institution with more than $9B in assets, as they discuss how they leverage their Guardian Analytics financial crime prevention platform to detect anomalies and suspicious activity in their online, mobile, and payments channels. 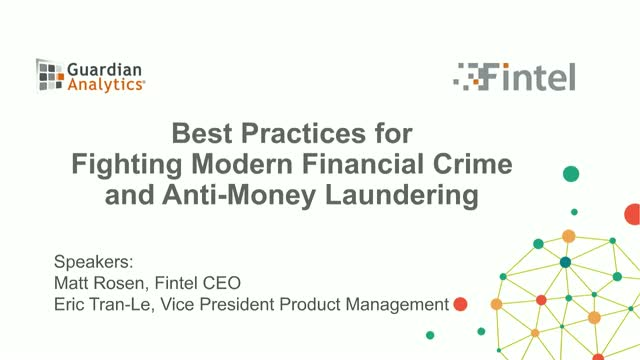 In this webinar Margarete Mucker, EVP of Operations from Star One Credit Union, shares what her organization is doing to protect their members from fraud. Although the recent Equifax breach that reportedly compromised 143 million accounts has sent consumers scrambling to protect their assets, financial institutions and corporations are likely to feel the impending effects of this attack as well. It is predicted there will be a surge in social engineering and BEC scams, as the hackers now have a wealth of information needed to impersonate individuals and corporate entities in a variety of contexts. However, the right strategic approach and technology solutions can effectively mitigate the fraud risk. In this webinar, guest speaker Andras Cser, VP, Principal Analyst in Security & Risk from Forrester Research, provides an expert industry perspective and discuss what financial institutions and corporations can do to protect themselves. You will gain insight into how organizations are raising their defenses, understand the best practices to minimize fraud loss, and learn how advanced analytics solutions can help minimize the risk. Watch this on-demand video to learn how machine learning and behavioral analytics are essential components to fight fraud in the 21st century. Guardian Analytics fights modern crime with a modern platform. We are the pioneer and leading provider of behavioral analytics and machine learning solutions for fraud detection and anti-money laundering software for financial institutions and enterprise organizations. Our solutions include Digital Banking Fraud Detection for Mobile and Online, Real-Time Payment Fraud Detection for Wire and ACH. Anti-Money-Laundering solutions that include Link Analysis and FinCEN reporting, addressing AML compliance requirements on a single platform, streamlining the case filing process. Over 450 financial institutions have standardized on Guardian Analytics’ innovative solutions to mitigate fraud risk and stop the sophisticated criminal attacks targeting retail, commercial, and enterprise banking clients. With Guardian Analytics, financial institutions build trust, increase competitiveness, improve their customer experience, enhance compliance and scale operations. Guardian Analytics is privately held and based in Mountain View, CA. For more information, please visit www.GuardianAnalytics.com.